Photograph courtesy Roger Geach Its a damp August 23rd 1975 as 25220 drops down onto a Birmingham - Newquay passenger train hauled by 46047. Its not known if the Class 46 was ailing or if the damp rail required the assistance of the Class 25. The sixteen year eleven month career of D7575/25225 was split almost equally between allocations to London Midland & Western Region depots. Time between last Classified repair and withdrawal: 48 months. Time between withdrawal & scrapping: 6 weeks. November 1963 to Cricklewood West (14B). October 1964 to Derby (16C). December 1964 to Cricklewood West (14B). January 1965 to London Midland (Midland) Lines (LMML). April 1968 to Allerton (8J). May 1970 to Manchester Division (D09). 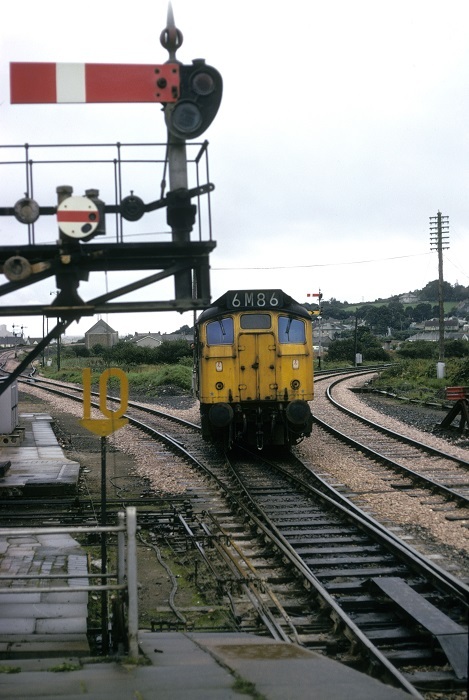 October 1971 to Laira (84A). 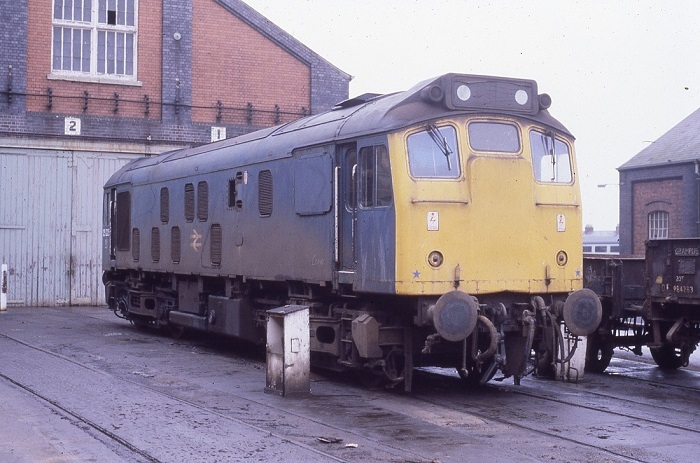 25225 was the 48th Class 25 to be withdrawn, one of four retired during October 1980, including shedmate 25223. On October 18th 1980, three days after its withdrawal 25225 was moved to Swindon Works, by the last week of November 1980 25225 had been broken up. 25225 is seen here at Swindon on October 26th 1980. The TOPS reports reveal 25225 was turned off for good on October 8th. 25225 was overdue an 'E' exam by 294 hours! Noted Derby Works November 1973. 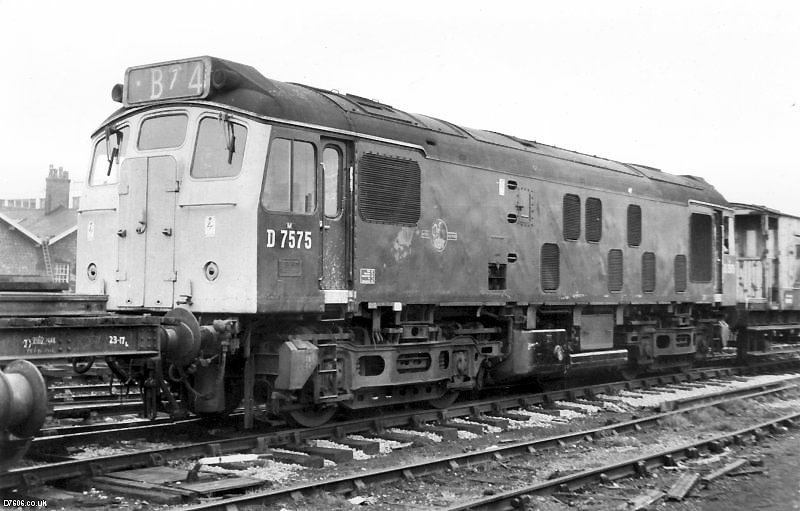 The frames for D7575 were laid down during the late summer of 1963 at Derby Works, with D7575 delivered to Toton during early November, then quickly transferred to Cricklewood (14A) the same month. On November 5th D7575 & D7576 had worked their test train to Corby. D7575 was noted working a Failsworth - Morecombe excursion on June 20th, the train had been doubled headed to Rochdale with 44356. On June 10th the summer dated roundtrip Nottingham - Llandudno Town service was hauled by D7575 & D7531. Paired Type 2s were still frequently allocated to Midland passenger services, on October 18th D5205 & D7575 arrived at London St Pancras with an early morning service from Leeds. Photograph courtesy RCTS Collection Ref#WARD293. A view of D214 & D7575 at Blackpool Central, sometime during the mid 1960s. With the WR making further inroads into its hydraulic fleet 7573 - 7575/7577 were transferred to Laira (84A) during October, part of a larger fleet reorganisation. At the time of these transfers 7574 visited Derby Works during October. The Class 25's were not the most popular machines in the south-west, their mechanical condition leaving a lot to be desired. Typical was 7573 spending a month out of service at Exeter before being moved to Laira for repair. The Class 25's had still not fully replaced the Class 22's on the local duties in Devon and Cornwall, crew training still taking place at several locations. Not helping matters was the use of Laira based 7574 at Bristol for crew training. Additionally the Class 25's were still not cleared for use on the Drinnick Mill branch. 7573 & 7575 would spend the rest of their working lives on the Western Region, they would become familiar locomotives handling the secondary passenger duties in the Exeter area, with eight years in this area it is more than likely they covered all the local passenger duties many times over. They would also be very active on the summer holiday extras and assisting the long distance workings out of Penzance & Plymouth from time to time. Photograph collection of Ian Hammond. Wigan is the location for this view of 7575 on August 21st 1971. The locomotive lacks the white stripe orginally carried, though some three years after the end of steam it still carry the 'D' prefix. On April 4th, 7th, 10th, 11th, 13th & 14th 7575 worked the 20.10 Exeter St Davids - Newton Abbot. 7575 was noted shunting milk tanks at Lostwithiel on May 20th. Derby Works was host to 7575 during June. 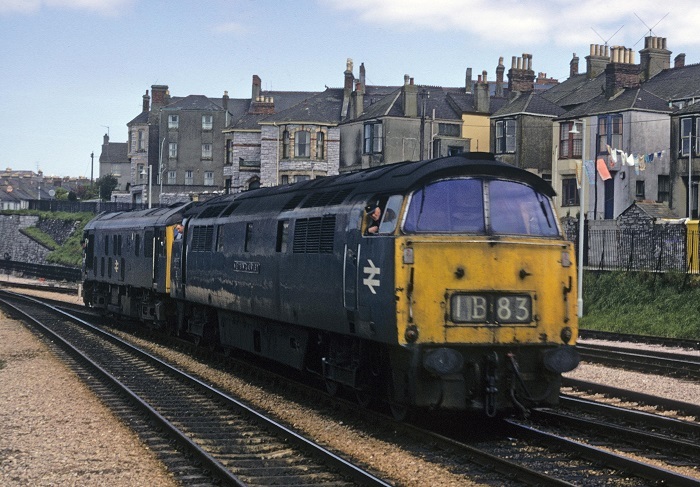 On July 1st 7573 & 7575 worked the 7B34 19.40 Bristol Temple Mills to Ponsandane freight, the 1E21 10.30 Penzance to Bradford passenger service to Plymouth, then light engines to Laira depot and ending with the 7B31 18.20 Plymouth Friary to Par freight. The same diagram was worked by 7575 & 7577 on July 15th. On August 12th, 19th and September 2nd 7574 & 7575 worked the 7B34 19.40 Bristol Temple Mills to Ponsandane freight, the 1E21 10.30 Penzance to Bradford passenger service to Plymouth, then light engines to Laira depot and ending with the 7B31 18.20 Plymouth Friary to Par freight. On September 16th 7575 worked the 09.51	Exeter St Davids - Barnstable, the return 12.18	Barnstable - Exeter St Davids, the 15.55 Exeter St Davids - Barnstable and the return 17.55 Barnstable - Exeter St Davids. On October 5th St Blazey received 7575 & 7676 for taking up further Class 22 duties, unfortunately 7575 was defective and returned to Laira for repair. Its replacement was 5180, with the two locomotives handling the trips to Dennis Junction, Retew and Goonbarrow Junction. On December 23rd 7575 worked the 15.55 Exeter St Davids - Barnstable and the return 17.55 Barnstable - Exeter St Davids. 7575 & 5223 were noted working an engineers train at Barnstaple on June 3rd. 7575 worked the 09.51 Exeter St Davids - Barnstaple and the return 12.20 Barnstaple - Exeter St Davids on September 22nd. 7575 paid a visit to Derby Works during November. On March 5th 25225 worked a roundtrip over the Taunton - Minehead branch to ensure the branch was 'operational'. The branch had last been used on January 4th 1971 and the imminent movement of 46229 'Duchess of Hamilton' from Butlins, Minehead to Swindon Works required the testing of the branch. The move of 46229 behind 25059 took place on March 13th. 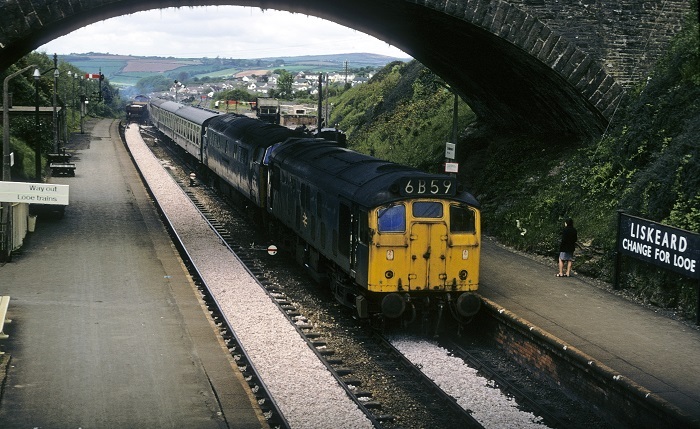 On Sunday May 11th the 1E21 11.35 Penzance - Leeds failed at Lostwithiel behind Class 52 No.1070 'Western Gauntlet', 25225 was added to take the train forward to Plymouth, where both locomotives were removed (see photograph below). Photograph courtesy Roger Geach 25225 & failed 1070 'Western Gauntlet' at Liskeard on Sunday May 11th 1975 with the 11.35 Penzance - Leeds. Photograph courtesy Roger Geach 25225 removes failed 1070 'Western Gauntlet' from its train at Plymouth on Sunday May 11th 1975. 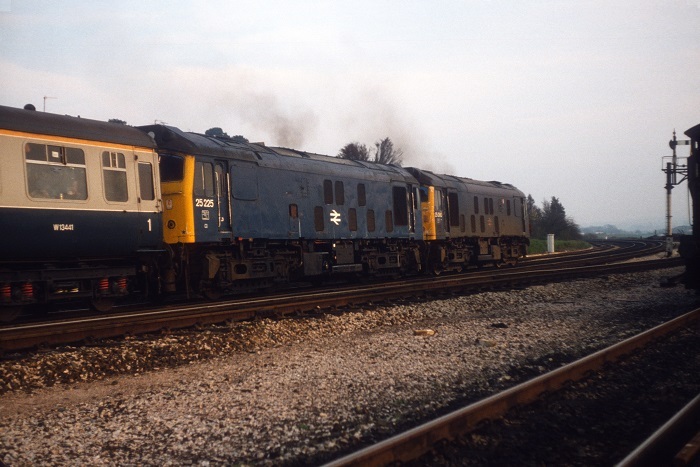 On October 29th the St Blazey Class 25s were dispersed as follows: Wadebridge, Liskeard & Hayle 25223; St Blazey - Drinnick Mill 25167, 25220; Goonbarrow Junction 25225; Control Train 25217. 25225 was at Derby Works during September & October. This was mostly likely the last classified repair carried out for 25225. The cab front gangway doors were removed during this repair. On July 24th 25225 was noted working the 20.50 Exeter St. Davids - Newton Abbot. 25225 was also noted around Exeter on August 14th & 15th on passenger workings. 25225 was the Exeter St Davids station pilot on April 1st. On June 22nd the 16.40 Plymouth - Paignton was worked by 25225. The WR witnessed a number of double headed Class 25s during the summer season, so noted was a Plymouth - Old Oak Common parcels with 25225 & 50029 (July 16th?). The 19.25 Exeter St. Davids - Paignton was worked by 25225 on August 29th. On September 10th the 09.35 Penzance - Wolverhampton was worked to Plymouth by 25225 & 25216. They returned west from Plymouth with the 08.08 Wolverhampton - Penzance Plymouth. The latter half of the summer of 1978 provided recorded examples of many diagrams worked. On July 22nd 25225 worked the 09.50 Exeter St. Davids - Barnstaple, the 11.57 Barnstaple - Exeter St. Davids, the 13.40 Exeter St. Davids - Barnstaple and the 15.52 Barnstaple - Exeter St. Davids. The same diagram was worked on September 2nd. On September 9th 25225 worked the 09.50 Exeter - Branstaple, the 11.57 Barnstaple - Exeter, the 16.40 Exeter - Barnstaple & the 18.03 Barnstaple - Exeter. Finally 25057 & 25225 worked the 21.00 Exeter - Newton Abbot. On September 10th a Bideford - Kingswear day excursion was worked by 25225 & 25057. The next day (11th) 25225 was stabled at Exeter mid-morning, later the 14.10 Exeter St Davids - Paignton and the 19.30 Exeter - Paignton were worked by 25225. On the very early morning of September 16th 25225 was stabled at Exeter. On November 25th the RPPR 'Welsh Wonder' railtour from Paddington to South Wales left the capital with 25157 & 25225 in charge. However all was not well with the pair, 46001 being added at Reading taking the train as far as Severn Tunnel Junction. Here 20044 & 20188 took over for a trip round the Welsh Valleys, the return to London was behind a pair of Class 37's. 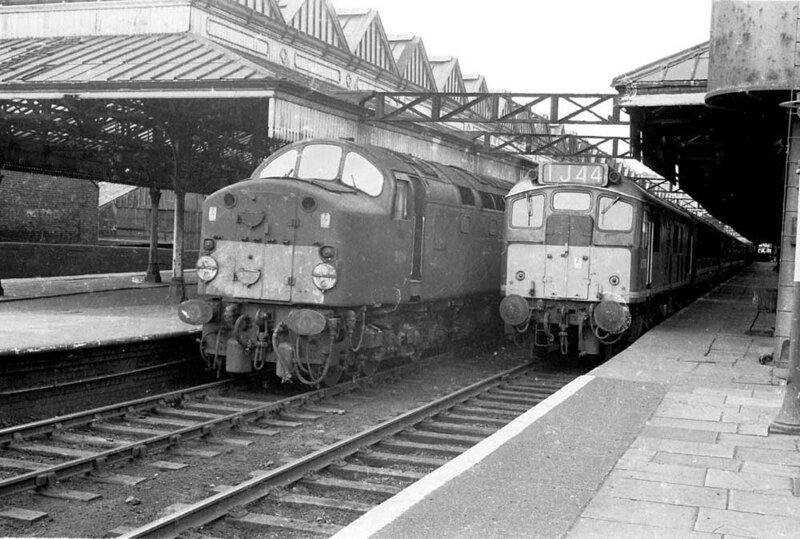 The Class 46 and the two Class 25s were later noted at Bristol Bath Road depot. This tour was repeated on the following Saturday, December 2nd, with 25052 & 25225 providing more solid performance between Paddington and Severn Tunnel Jct. Photograph collection of webmaster. 25225 & 25052 stand at Melksham on December 2nd 1978 with the re-run of the 'Welsh Wonder' railtour. The year closed out with bad weather on December 29th. Heavy snow over the New Year plagued services with delays and faulty equipment made life even more difficult to maintain the timetable. In the West Country Exeter proved to be a graveyard for frozen up locomotives, with temperatures reaching down to -13C most things simply froze up. The 00.05 Paddington - Penzance was reported sixteen hours late at Plymouth, 50046 had left Paddington 150 minutes late continuing to loose time throughout the journey, before expiring completely at Brent, with 47106 coming to the rescue. The train was cancelled at Plymouth with Penzance passengers connecting with the 10.30 from Paddington, arriving at Penzance some eighteen hours late! At Exeter the local services were cancelled with the diesel multiple units frozen solid. 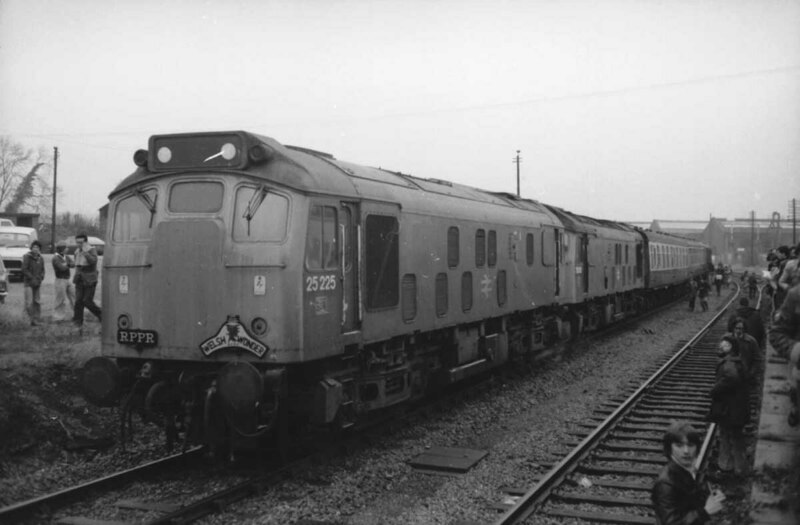 The diesels fared little better with eighteen frozen up locomotives including 25052, 25206/225/263, the only serviceable machine being 46020, which had been equipped with steam lances for the freeing of pointwork and rodding. Despite its continued allocation to Laira, 25225 produced no reported passenger workings during 1979 - obviously 25225 was out there in action, just so far unreported! It should be noted that with eight years spent at Laira the average mileage for the passenger trains worked by 25225 was about half that of the norm for the Class 25 fleet. 25225 was noted at St Blazey on June 23rd. On October 15th 25225 ran light engine to Fowey to pick up some empties, then worked later in the day to Drinnick Mill with clay empties. Loaded clay wagons then returned to Burngullow during the afternoon hauled by 25225 & 25206. On February 16th 25225 worked the 16.08 Exeter St. Davids - Barnstaple, the 18.03 Barnstaple - Exeter St. Davids and the 20.10 Exeter St. Davids - Paignton. Three days later (19th) 25225 worked the 19.37 Exeter St. Davids - Paignton. This working was also handled on March 21st. Railtour duty befell 25225 & 25080 on April 12th, taking over at Exeter from 31304 & 31163 on a Paddington - Meeth / Meldon Quarry railtour, the Torrington - Meeth section top and tailed due to lack of run round facilities at Meeth. The special also covered the line to Meldon (see image below). Photograph courtesy Bernard Mills. 25225 & 25080 at Cowley Bridge Junction on April 12th 1980. Late July / early August workings included July 31st's 14.16 Exeter St. Davids - Paignton, August 2nd 19.05 Paignton - Exeter St. Davids, August 3rd 12.25 Newton Abbot - Exeter St. Davids and the 14.45 Exeter St. Davids - Paignton. 25225 came to the rescue of the 18.56 Exeter - Barnstaple diesel multiple unit on August 15th (throughout?) & returning with the 20.50 to Exeter. On August 24th a four coach Torrington - Southampton excursion was worked by 25225 from Torrington to Bristol Temple Meads. 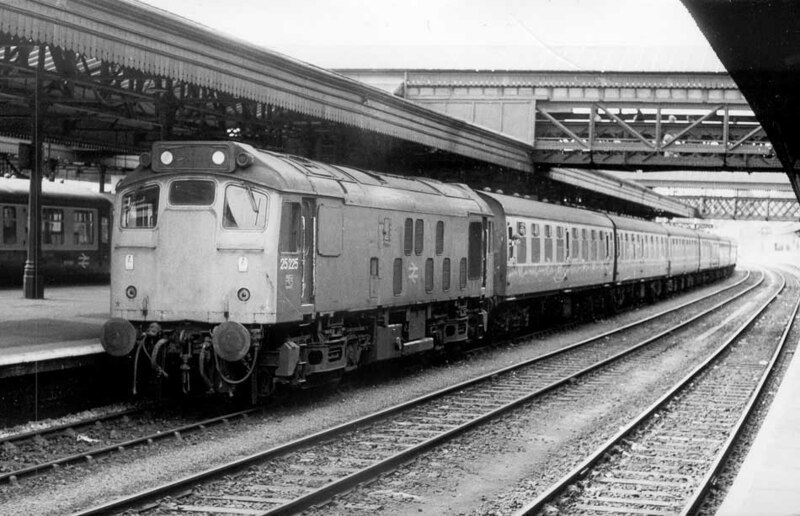 Here the four coaches were attached to a Bristol - Portsmouth Harbour service hauled by 33110. The return was similarly worked with 25225 taking over at Bristol for the return to Torrington. On September 15th 25225 worked the 18.00 Barnstaple - Exeter St Davids, having to later return to the branch to assist ailing 25207 on the 17.15 freight to Exeter. Photograph courtesy Danny Preston, collection Neil Johnson. Its August 30th 1980 as 25225 stands at Exeter St Davids with the 17.25 to Paignton. 25225 was withdrawn on October 5th 1980. Page added June 21st 2002. Last updated March 3rd 2019.